China's star track athlete Liu Xiang has admitted he has not fully recovered from a hamstring injury, but says he is confident of Olympic success. In an interview with China's CCTV, the 110m hurdler said his injury was "not so great", but added: "I hope I can get completely fit in the next two weeks." Liu is seen as China's best prospect for gold on the track in Beijing. But he faces competition from Cuba's Dayron Robles, who broke Liu's world record, running 12.87 seconds in June. "I feel like he is born to be a hurdler," Liu said of his 21-year-old rival. "He is terrific. But I still believe I am able to beat him. After all, he is younger than me." He also dismissed concerns that the expectations of the Chinese public would affect his performance during the Games, which begin on 8 August. "People may think I am under great pressure now, but I feel that day by day there is no pressure on me," Liu said. "The level of my skill is there, and the key point is to grasp the opportunity. I trust myself." 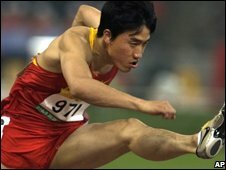 Liu shot to fame in China after winning gold in the 110m hurdles at the 2004 Athens Games.